The government should scrap tax credits and pay parents to stay at home caring for their children, a report argues. Paid post-natal parental leave should be extended to a full year, say the Daycare Trust charity and the Social Market Foundation think-tank. Then a new "home care allowance" should cover children up to the age of two. Their report argues that a package of early education, care and parental leave could have significant economic and social benefits for Britain. This is estimated at 1% to 2% of national income, or £12bn to £24bn a year. This would come from increasing parental employment and boosting the future productivity of the children who had had high quality early education and care. The valuation, by PricewaterhouseCoopers, says Sweden and Denmark currently spend about 2% to 2.5% of their gross domestic products on early education and care - excluding parental leave payments. The social benefits would flow from having fewer children living in poverty and from lifting the "life chances" of those from disadvantaged homes. The cost to the taxpayer would rise gradually to the equivalent of between £8bn and £15bn by 2020, says the report. Childcare tax credits would eventually be abolished to help meet the costs, with funding going mainly to early education and care providers. The childcare "vision" includes the 8am to 6pm "wraparound" childcare set out in the government's proposals for extended schools. It also envisages free early years places for all two year olds. The one-year parental leave would involve six weeks at 90% of normal earnings and the rest at the national minimum wage. An option would be to extend parental leave to 18 months, instead of the care allowance - which would eventually be worth on average 50% of the minimum wage. The report says "it is generally agreed" that parents would have to contribute to extended schooling. It says a maximum of 30% of the costs would be comparable with other EU countries with well-developed early years provision. Adopting the Swedish model, for instance, would translate in UK terms to a cap of about £21 a week for the first child, falling to about £7 per week for the third child - with others being free. "This would certainly make early years provision affordable for all, but at the cost of giving a significant tax-payer subsidy to better-off parents who could afford to pay more." The director of the Daycare Trust, Stephen Burke, said: "All parents and children should have the chance to enjoy time as a family and have access to quality affordable childcare and early education to get the best start in life. "It's vital that we continue to be ambitious and develop a clear vision for the future that builds on existing achievements." 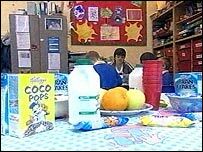 In response, the Department for Education and Skills said it would unveil its own plans for early years and childcare as part of the Pre-Budget Report later this year. "However, the proposals set out in these reports today represent what might be done if money were no object. "We believe childcare needs to be both affordable for parents and affordable for the government and the tax payer."